brushes work your encapsulation chemical into the carpet from multiple directions. • Cleans fast: 1,500-5,000 sq. ft per hour! • Be competitive on commercial carpet cleaning! • Easy training: learn to use in minutes! • Perfect when warranties prohibit bonnet cleaning! quieter, more powerful turbine power head than Turbocat Zoom. 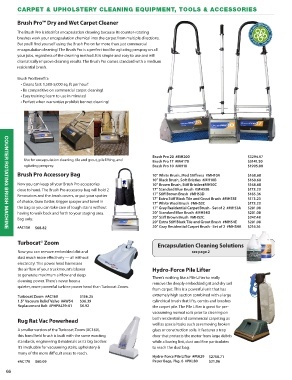 It’s invaluable for vacuuming stairs, upholstery &      to reach the dust bag. many of the more difficult areas to reach.